There is no better place to be in life than running your own business. When you are self-employed you don’t mind working extra hours, there is no boss breathing down your neck, and you are in charge of your own destiny. Money is hard to come by and so, sometimes, is employment. With a little imagination and a lot of hard work you can overcome both of these problems by starting your own business. All you need is a good idea and the confidence to make that jump which will set you on track to earn money and have fun in the process. Your business can be part time of full time – you decide. 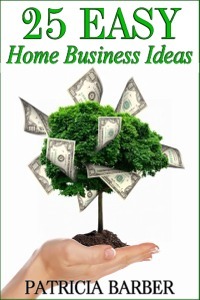 All the businesses in this book can be started from home with very little expense. You will probably find that you already have most of the things you need to start your chosen business right there in your own home. You won’t need an in depth knowledge of technology or even any formal qualifications. The 25 ideas in this book are all easy to get off the ground, real ideas for real people. All you will need is good common sense, lots of energy and enthusiasm and a few organisational skills. I hope that some of the ideas in this book will give you that spark of inspiration to get moving and start getting your own business off the ground. It’s easier than you think. Time to stop talking and start working, you’ll love it. Kindle edition available for £1.52 at Amazon UK and other regional Amazons.